JOY English Camping Trip 2015!! 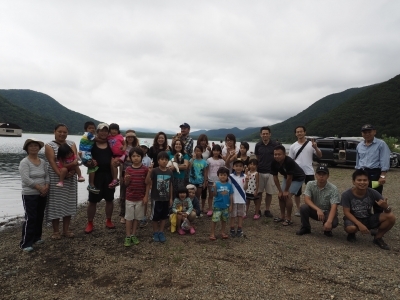 This August, Joy English took their annual camping trip to Fuji Five Lakes. With over 30 people and three English teachers in tow, we camped right next to Lake Seiko. Our tents dotted the lane leading up to the lake, and we built a beautiful campfire right upon the shore. For lunch we ate udon noodles, a local Yamanashi specialty. After that, we spent the afternoon playing in the lake. One English teacher explained the creatures you could find on the edge of the lake to the children. The other teachers talked about camping traditions, up to and including telling scary stories. Saturday night we cooked our own food by grills and over the campfire. We cooked brats, hot dogs, and a special dish called ‘hobo potatoes’. For that, you take cut and peeled potatoes, chopped carrots, and chopped onions, add butter and salt, and fold them into tin foil. You then put the foil pouches directly into the fire to cook. They turned out quite tasty, giving everyone a fun, unique piece of food to enjoy. For dessert we made a traditional American campfire food called s’mores. These tasty treats involve talking marshmallows and cooking them over the fire until they’re soft. You then put them between two graham crackers and add a piece of sweet American chocolate and chow down. It’s very tasty, with some kids eating six or seven! That night, many in the group headed to the local onsen to relax and rejuvenate. Many kids got together and went on a beetle hunt. 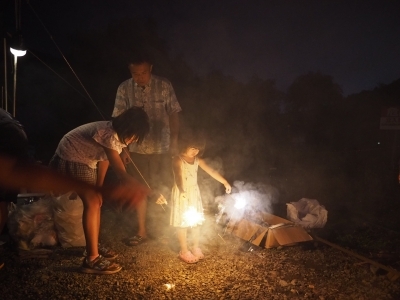 Others stayed by the campfire and were treated to a fireworks display from a nearby camp. It was very lovely, though the dogs that tagged along did not like it quite as much as the humans. The next morning, we woke up and took in the beautiful views of Lake Saiko at dawn. We made a massive breakfast as coordinated by our English teachers. 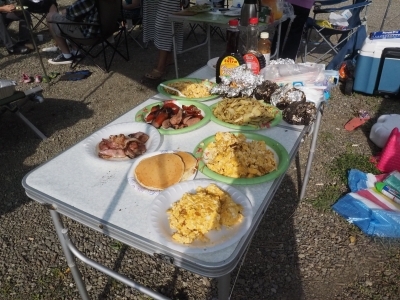 This included pancakes cooked over the campfire, sausage, bacon, and eggs. We brought over fifty eggs to cook and scrambled them on a large skillet, adding cheese and salt to taste. After breakfast, we played a few games, including a tricky, fun American word game. But it was getting to be afternoon and the clouds were rolling in. We packed up, secure in the knowledge that next year would bring another fun excursion to beautiful Lake Saiko and more time to spend together.